We’re officially out of the frying pan, and into the fire. With alarming speed we’ve gone from companies not understanding the merits of content marketing at all, to a place where 70% of B2B marketers and 69% of B2C marketers say they will be creating more content than ever this year (according to Content Marketing Institute and MarketingProfs research). The unofficial official narrative of the content marketing “movement” is that it’s an arms race. That everyone must create more and more content to keep up with competitors that are doing the same. There is a kernel of truth to that notion in that companies must–at a minimum–satiate all customer inquiries and needs, across all buyer types, and all stages of the consideration and purchase funnel. But once you’ve got your content house sufficiently constructed, you don’t need to keep adding bathrooms that nobody will use. 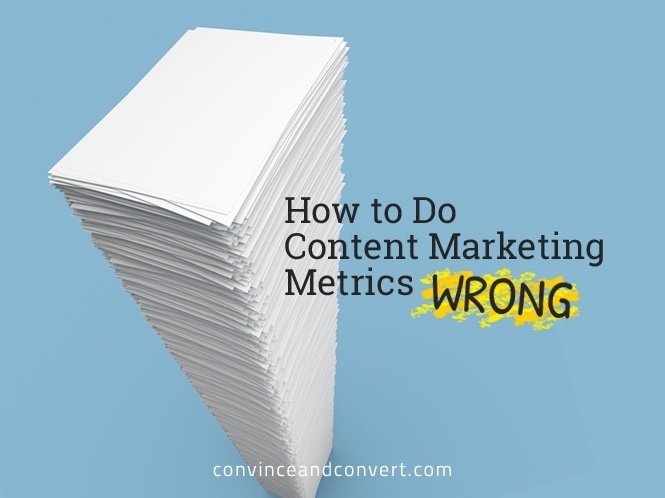 Volume of content is not a content marketing success metric. Alas, in just the past week I’ve had three conversations with very smart marketers who are getting sucked into this vortex whereby “look how many blog posts and infographics we made this quarter” is how content marketing is judged, and how budget is secured. First, it is wholly unsustainable. I always recommend that businesses create broad, top-of-the-funnel content that isn’t about the company or its products or services per se. This mandate to give yourself permission to make the story bigger is a key tenet of Youtility, and has been proven to work by many organizations like Marketo, Maersk, et al. I was talking to a brilliant marketer just today, who told me that their company created hundreds of YouTube videos in the last 90 days, but only 20% of them had even 1,000 views. If you are using content volume as a metric, you are celebrating that you made hundreds of videos. But in the real world, where content’s reason for existence is to drive desirable consumer behavior, 80% of that initiative may be nearly useless. The goal isn’t to create content, it’s to create content that makes a difference.